17th Parallel is the boundary between North Vietnam and South Vietnam before the two were united. 24th Parallel is the line which according to Pakistan is the boundary between India and Pakistan. This, however, is not recognised by India. 26th Parallel south is latitude which crosses through Africa, Australia and South America. 30th Parallel north stands one-third of the way between the equator and the North Pole. 33rd Parallel north cuts through the southern United States, parts of North Africa, parts of the Middle East and China. 35th Parallel north forms the boundary between the State of North Carolina and the State of Georgia, the State of Tennessee and the State of Georgia the State of Alabama. 36030’ Parallel north is the boundary between the Tennessee and Commonwealth of Kentucky between the Tennessee River and the Mississippi. 40th Parallel north is the boundary of the British Colony of Maryland. 41th Parallel north is the boundary between Nebraska and Wyoming and the southern boundary of Wyoming with Colorado and Utah. 42nd Parallel north is at the New York - Pennsylvanian Border. 43rd Parallel north lies between the State of Nebraska and the State of South Dakota. The Parallel 440 north is 44 degrees north of the equatorial plane. 45th Parallel north also called the halfway point between the Equator and the North Pole. 45th parallel is the boundary between Wyoming and Montana. Radcliffe Line was drawn by Sir Radcliffe. 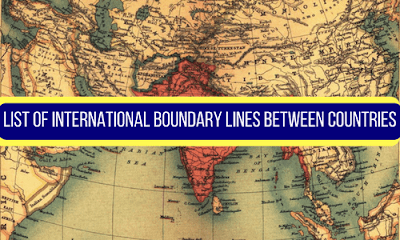 It marked the boundary between India and Pakistan. Mannerheim Line is the line of fortification on the Russia Finland border. Drawn up by General Mannerheim. Medicine Line is the border between United States and Canada. Hindenburg Line is the boundary dividing Germany and Poland. Order-neisse Line is the border between Poland and Germany, running along the Order&Beisse rivers, adopted at the poland Conference (August 1945). Durand Line is the boundary line between Afghanistan and Pakistan. It was drawn up in 1896 by Sir Mortimer Durand. Macmahon Line was drawn up by Sir. Henry MacMahon, demarcating the frontier of India&China. China did not recognize the MacMahon line and crossed it in 1962.